About The Book: Ram Rajya. The Perfect Land. But perfection has a price. He paid that price. Begin an epic journey with Amishs latest- the Ram Chandra Series. About The Author: Described as 'India's first literary pop star' by world-renowned film director Shekhar Kapur, Amish's unique combination of crackling story-telling, religious symbolism and profound philosophies has made him an overnight publishing phenomenon, with spiritual guru Deepak Chopra hailing Amish's books as 'archetypal and stirring'. The time when it is said God has given up on man! For if not, Chandrashekhar Kashyap would not exist. Blessed by the Devas, he and his friends are the last line of defense between mythology and reality. Join Chandrashekhar, the Shivaputra, as he comes to terms with his own capability and fights the greatest evil ever to have risen against the world! About the Author: Originally from Palampur (a small hill station in Himachal Pradesh), Stutee Nag has been residing in Chandigarh for last eight years now. She works as a Law Researcher at the Honorable High Court of Punjab and Haryana. During her college days, she was part of the popular reality show MTV Splitsvilla, where she ended up as the second runner up. She also runs a blog at http://stuteenag.blogspot.com where she describes herself as someone who is a lawyer by day, but moonlights as a wannabe writer. Apart from writing, she is big on travelling and hopes to cover all the seven continents before she turns forty. Life zigzags in a funny way. At eighteen, the whole world had seemed to be at her feet and at twenty five, not so much. Somewhere between failed relationships, bad career choices and an itch to be something in life – Tanu Lost Track. How did this happen to her? She was a good girl after all. Splitsvilla – Her not so successful experiment with fame. Soma – Her crazy doppelganger from lala-land, Dvd- The nuttiest of her nuts and Yathaarth – the man who has the capability of drawing her like a moth to a flame (and then reducing her to ashes in five seconds flat). Add to this Asmi + Garv , a bizarre couple, who have a story of their own and bam! It’s Tanu in wonderland. Amidst a fucked up past, a dwindling present and a not-so-bright future, here she is, trying her best to figure where to head with her little claim of fame – HER TEN MINUTES OF GLORY. Will Tanu Sharma get back on track? About The Author: Born in Meerut district, Uttar Pradesh, Shalabh Bansal is a trained Marine Engineer. After graduating in Marine Engineering from BITS Pilani (Tolani Maritime Institute, Pune campus), he kicked off his sea career in 2007 when he first joined a vessel as a Cadet. At present, he is sailing as First Engineering Officer with Seaarland Management Services, Mumbai. Having sailed across almost all seas and continents, he continues to feel the urge to explore more and more every day and ride the high waves unbounded. Shalabh believes that water gives him strength. He likes to watch the sun rise over the ocean,which gives him a feeling of a fireball emerging from the waters.Though,despite year of sailing experience behind him, he is still scared of water. Extremely caring, Shalabh loves making friends and exploring new horizons with them. Despite being one of the nominees of the 2020 Mars-1 Program, he withdrew his application and decided to continue sailing, which he loves more than anything else. About the Book: All was going well for Samar. He had a promising career in the merchant navy ahead of him, and he was looking forward to his next sailing assignment. Then came along Arisha, and he discovered the love of this life. What could possibly go wrong? 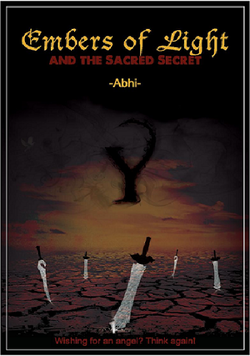 This is the story of Samar and Arisha and their battle with the ultimate master-Time itself. And how sometimes, the most extraordinary things happen to ordinary people. In the ultimate clash between Love, Life, and Time, who could possibly win? About the book: Right since childhood, the world in which we live teaches us to bury our 'bad' past somewhere deep inside us and just move on. So deep, that even we can't possibly dig it back out. What happens when a 10 year old child, who claims to be your future son, comes to you to help you find his mother, who's your perfect match? What happens when you eventually start doubting his intentions? What happens when a girl starts turning your dreams into nightmares? What happens when your 'future son' starts haunting you? What happens when your FUTURE starts bleeding into your PRESENT through your PAST? 'Hey Dad! Meet My Mom!!!' is nothing less than a roller coaster ride of mystery, love, comedy, fear and suspense. So make sure you don't forget to expect the unexpected!! About the Book: "How it feels to be a bachelor? What all a guy does in social networking sites? How do cell phones and social networking sites play a role in the life of every teenage boy or girl? Well if you’re thinking why I am telling you this, then let me tell you, I, Me & Her Forever is about these things. It’s a tale about crushes, flings, love, relationships and break ups. What goes in the mind of a boy or a girl when they are about to get commited? What all they do when they are in a relationship? Love turns into madness and obsession. I, Me & Her Forever is the story of Abhishek and Meghna, who were friends for some time and then it turned into serious love. Utterly serious!!! How much serious you will get to know by reading the book, though it was somewhat indifferent of Abhishek, because he was the one against relationships. But you know love is love. It is like gravity. It is inevitable. " About The Book: Love happens when you least expect it… Sameer is a Steve Jobs fan, a consultant at an investment bank, and a confused soul looking for love. As he moves cities to study and work, he falls in and out of love, but fails to find the one person who belongs to him. In comes Shagun, whom he marries. But he leaves the very next day for Switzerland… to start a dream Job. In the meantime, Shagun starts reading his diary! What does she find in there? Just the Way You Are is a humorous, heartwarming story about one man’s quest for true love. About The Author: Sanjeev Ranjan is an ardent lover of western classical and instrumental music. He enjoys reading and has a keen interest in understanding human behavior and relationships. He is currently pursuing his MBA from the Indian Institute of Foreign Trade (IIFT), Kolkata. He is the author of It’s No Longer a Dream (2014) and In Course of True Love! (2012). This is his third novel. What are these strange visions? What is wrong in her head? Why does she get strange feelings before incidents happen? Nishtha Vaidya is a survivor of a terrible natural calamity. Not only does she live on with survivor’s guilt, her mind is still there, on the ill-fated day and she could never come out of it. Just when things are beginning to settle slowly in the safe and cozy life in vibrant lifestyle of Gujarat – Nishtha is getting strange visions and headaches. Life is taking her back two years in time and she finds she is running around the state, saving different and unknown lives from mortal peril. Will Nishtha get answers to these mindboggling questions? Will Nishtha be able to pay tribute to her friends whom she lost? Has her untold love story got anything to do with it at all? Will Nishtha ever unburden herself? The story begins in the peaceful streets of Ahmedabad and occasionally travels down the memory lane of Nishtha as she remembers her life in Australia when she had gone as an exchange student. The fateful Tsunami rips off Australia and Nishtha loses all her friends and her yet-to-be-started love life. Back to where she belongs, Nishtha finds it difficult to adjust to living itself after undergoing treatment for almost a year. She soon finds that her mind is still in hyper active state and that she gets strange sensations and feelings before any calamity or near-death situation is going to happen in a gruesome way. Nishtha wants to know why it is happening but before that she has to put her ghosts to rest. But will she be able to do so? What can give her peace? Is there a rational and a scientific explanation to what’s wrong with her? Will she ever be able to get back to the normal Gujarat life that she had lived or is the nightmare going to haunt her forever? About The Author: Vinit K. Bansal began his journey as a poet and soon, he graduated as prolific author and editor of national repute. His first novel 'I am Heartless' created a sensation in the Indian writing industry and is widely considered as one of the top ten Indian romantic novels that redefined romance. His anthology series 'Uff Ye Emotions' has been the synonym of success in the segment since the past couple of years. Versatility remains the key factor in Vinits writing and has helped him create a niche for himself as a writer in both, Hindi and English language in fiction as well as in the non-fiction segment. Other than writing, he is a creative consultant and a motivational speaker as well, often conducting regular sessions on motivation and personality development in different academic institutes of India. This is a story of love, friendship, passion, obsession and sacrifice. A story that seeks to find out the real meaning of love. A story describing the purest form of love. Neel is a simple small town middle class boy who comes to a new city for studies. On his very first night in the city, when he saves Ranadeeps life, he realizes his life is about to change. But he had no idea that it would lead him to a path from where there would be no turning back. Neel and Ranadeeps friendship cements beyond the conventional measures and they are inseparable and like a family. Neel eventually meets Aditi, his beautiful, simple and dainty new classmate and there is love at first site. Life for Neel, Aditi and Ranadeep is perfect till the day Ranadeep meets Ria and falls obsessively for her. While Ranadeep is frighteningly obsessive about Ria, the suave Ria has her heart set on Neel. Things begin to get complicated and then suddenly something drastic happens. Neel is put behind bars on charges of Rias murder. Will Neel be able to convince his innocence to Aditi and Ranadeep? Will Ranadeep ever be able to forgive Neel for snatching away his love? How far can Aditi go to save the life of her love from the grips of destiny? Can there be a love without ownership? Find out what happens when love has to pay its price. About The book: Do you believe in God? To many of you, the answer may not come instantaneously, or will be far more complex than a simple yes or no. Those are the ones who believe that a superpower exists and have often felt it in the smallest of things around but are not sure what it really is. Suppose they are right and some superpower exists, let’s say God, then who really is this God? Is he what the world tries to teach us or is the truth something else? There are many religious books filled with innumerable praises of that almighty, trying to explain the unexplainable. But sometimes the rosy answers in them do not match the stark realities of the world, thus creating many new questions and doubts. What does one do then? Cover them with the sheets of faith? Is faith in that power the answer to every question or are we allowed by that power to have doubt in it? What if the God does not seem righteous, then should we surrender ourselves blindly to the faith or dare to stand up the supreme power? This is the story of some courageous people who take on angels and demons, travel across parallel universes, stand up before the Lord of Death, challenge the Queen of Destiny, rise above every fear, even the fear of God, and do what their heart felt was right. A strange Y shaped symbol in the sky, terrified a mysterious alien race living secretly on this planet for centuries, and changed forever the fate of five humans; a Brazilian street fighter, an American cop, a Chinese karate instructor, a Russian environmentalist, and an Indian ad maker. Meanwhile a geek in NYC is amazed to see his dreams growing more and more bizarre each day and met an angel who isn’t conventional in any way. It is best when some secrets remain hidden and some stories remain untold. But is destiny too kind to respect this fact? They could have heaven, but they did not take it. The demons were against them and so were angels, but that did not scare them. Destiny had already ruled against them, but they chose to rebel.